Featuring free WiFi throughout the property, Queen Palace Hotel offers accommodation in Abu Dhabi, 700 metres from Al Wahda Mall. Guests can enjoy the on-site restaurant. Free private parking is available on site. The hotel also offers car hire. Qasr al-Hosn is 1.9 km from Queen Palace Hotel while Abu Dhabi Mall is 2.5 km from the property. 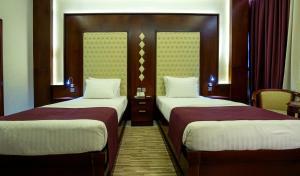 The nearest airport is Abu Dhabi International Airport, 28 km from Queen Palace Hotel. Please note that all guests must deposit an amount of AED 100 against their stay as a security deposit.